Awoooo! Get ready for some ghost busting fun! Ghost Poppers is a crazy chain reaction game that uses your skill to set up zombie heads and explosions. With many exciting levels and mind blowing strategies the fun never ends! Come and join the challenge today! • Simple to learn. Hard to put down! • New PowerUps will help you get through the hard levels! • FREE Hints EVERY DAY! Can you go all the way? 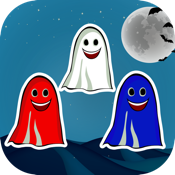 Download now and we challenge you to finish all the levels of Ghost Poppers! Enjoy!